Product prices and availability are accurate as of 2019-04-16 07:26:01 EDT and are subject to change. Any price and availability information displayed on http://www.amazon.com/ at the time of purchase will apply to the purchase of this product. Speedy Organizer "The Digital File Cabinet for Windows". 30 day unconditional return policy. 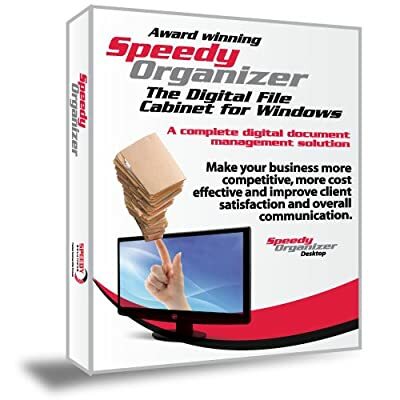 Seamless interaction to store documents with Microsoft Office, Microsoft Outlook, Microsoft Word, Microsoft Excel, Gmail, Google Docs, Adobe PDF, Quick Books and more. Documents will always be at your fingertips all of the time. Never lose a document again! Retrieving and searching for documents has never been easier or quicker. Documents can now be distributed around the world for Free! Secure access to critical or confidential documents by automatically assigning administrative and user ID's.